All right folks. We're hitting the lull in the movie season here in September, and if you're not heading out to see RIDDICK this weekend, here are some fun titles for you to watch. Two of them I really enjoy, and one I absolutely hated. Now, that may seem weird because why would I recommend a film that I hated. I'm curious to hear your thoughts on it. So feel free to watch, and then come back and comment how right or wrong I am! This is not a movie for agoraphobics. A couple is accidentally left in the open sea while on a scuba diving trip. It's a small but extremely tense and psychological thriller. And it will make you never want to go scuba diving, or it will make sure you make friends with everyone on your boat so you're not left behind. 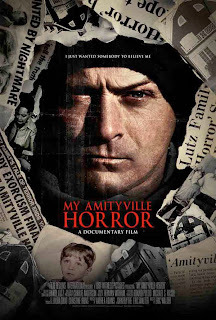 We all know that the classic horror film, AMITYVILLE HORROR, was based on true events. In this documentary, director Eric Walter takes a look at the family centered around those hauntings, the Lutz's. Most of the siblings declined to be in the film, but the eldest, Daniel, agreed to tell his story. Being a freshman director, I'm not sure if Walter was prepared for the story he was about to hear. This ends up being a fascinating tale about Daniel's horrific childhood and the sour relationship between him and his father. Check out my review from last year's Fantastic Fest here! I hated this film. Hated, hated, hated. I also cannot fathom how this film got positive reviews. It's a sad excuse for a so-called "female empowerment" horror film. It's actually a sad excuse for any film. But I am recommending it here because I need you to see how bad it is, and how much the Soska sisters do not need to make any more movies...ever. And you can check out my review here.